Nodding bell-shaped flowers to bring a little Christmas magic to your garden. Winter-flowering clematis to brighten up your garden with flowers from December through to spring. A lovely variety with pretty nodding blooms. Deep green lustrous foliage that looks great the whole year round. Brighten up your garden in the dreary winter months with this fabulous evergreen, winter flowering Clematis 'Jingle Bells'. Its dainty nodding blooms make an appearance when the garden can be at its bleakest and are an uplifting and cheery sight indeed! Easy to care for and needs no pruning so can be planted anywhere where the sun reaches - even in the most inaccessible spots. 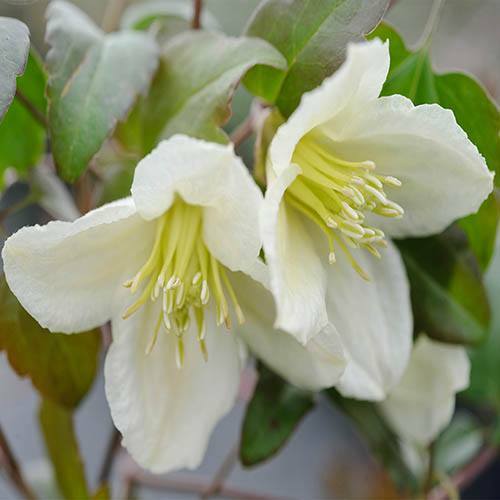 Clematis Cirrhosa 'Jingle Bells' is a vigorous evergreen climber with attractive, 3-lobed, dark green leaves. The pale cream, nodding flowers have slightly curved petals are produced from around Christmas to March and are followed with attractive, silky seed heads. Suppled as an established plant in a 7cm pot. Plant with the crown of the plant 5-8cm deep to encourage new shoots to grow from below ground level. No regular pruning is required, just remove any dead, damaged or diseases stems before cutting back to a pair of buds to maintain shape. Prune immediately after flowering in mid- to late spring when the danger of frost has passed.